I installed Ubuntu 12.10 on my Lenovo T510 this evening after a very long hiatus. It’s only been a couple of hours but I am impressed with how polished everything seems to be. 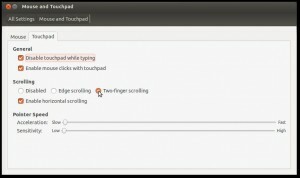 I have run into one little annoyance though, and that inspired the first post in quite a long time: How to enable two-finger scrolling on Ubuntu 12.10? 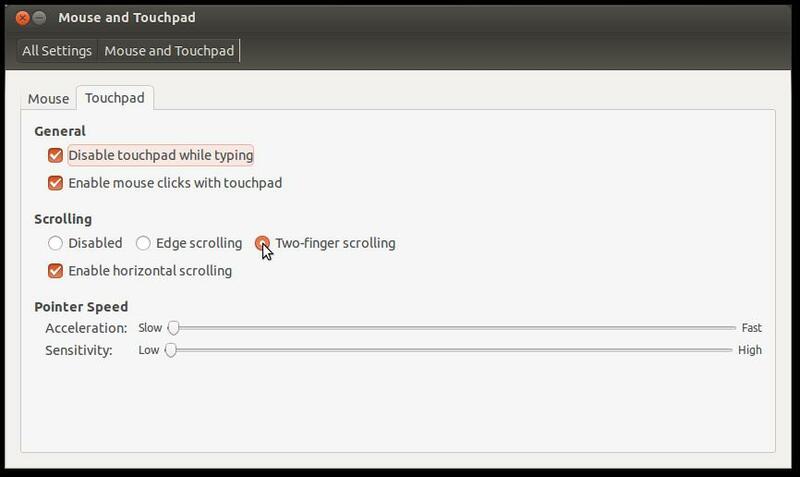 When I first installed Ubuntu 12.10 on my Thinkpad I noticed that the touchpad wouldn’t scroll. Being very used to my MacBook at the office, this was initially very frustrating. Not being able to scroll was definitely going to be a pain. I was sure Ubuntu would support this, but how to activate it? I did a little bit of digging and found it was quite easy to toggle on within the System Settings. It turns out it’s simply a setting to be toggled on or off within the System Settings. First, navigate to the “Ubuntu System Settings” application. You should be able to find this in the Launcher along the left-side of the screen. Second, select “Mouse and Touchpad” and select the options “Two-finger scrolling” and, optionally, “Enable horizontal scrolling”. Just like that your touchpad should now support two-finger scrolling!